Wilbur and Orville Wright flew the first airplane in 1903 near Kitty Hawk, North Carolina. 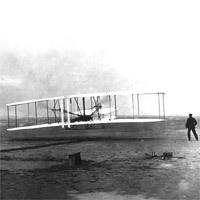 Orville piloted the first successful flight. Then Wilbur had his turn. Each flight lasted less than a minute. The flights were results of years of experimentation. Children could view the Wright Brothers’ accomplishments at: First Flight. They could also read Russell Freedman’s The Wright Brothers: How They Invented the Airplane. Airplane was patented by the Wright Brothers in 1906. 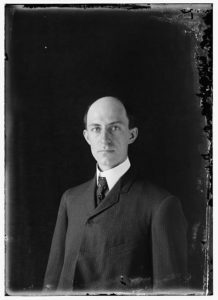 Wilbur Wright and Orville Wright had applied for the patent in 1903. They received patent number 821393 for an “improved flying machine.” Children can view the patent at: https://www.google.com/patents/US821393.